sits a row of eateries serving num banh-chok, a dish of fermented rice noodles topped with 'curry' that's nearly identical to Thai kanom jeen (note the similarity between the words 'kanom' and 'num'). They're all but empty when we whiz by at 630am on our way to watch a family make palm sugar, but the big metal pots stuffed with all sorts of interesting edible greens sitting on each table immediately catch our eye. 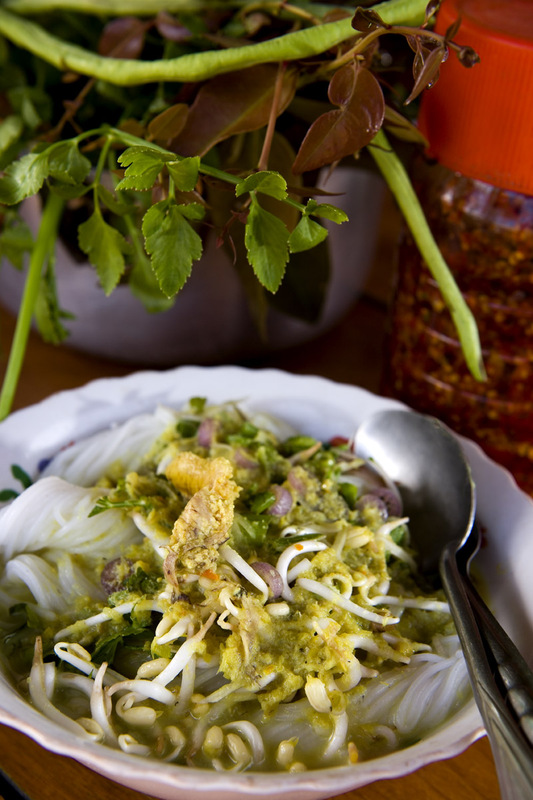 Ever since we first sampled kanom jeen in Bangkok we've been obsessed with the dish. 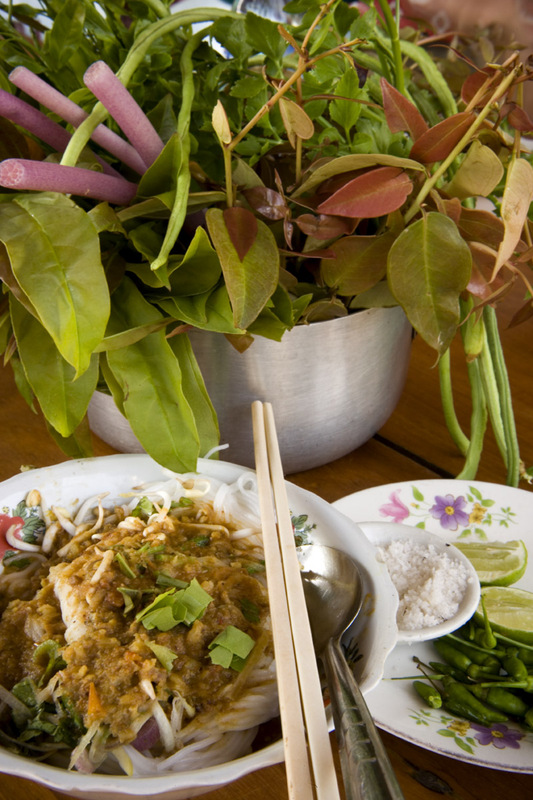 In our estimation it makes for the perfect tropical-weather meal: cool noodles topped with a warm but not-steaming-hot gravy, served with all sorts of fresh (and, in Thailand, cooked) vegetables on the side that one can add at will to tailor the dish to his or her own liking. We tend to add so many veggies to our kanom jeen that we end up with something resembling a wet noodle salad. 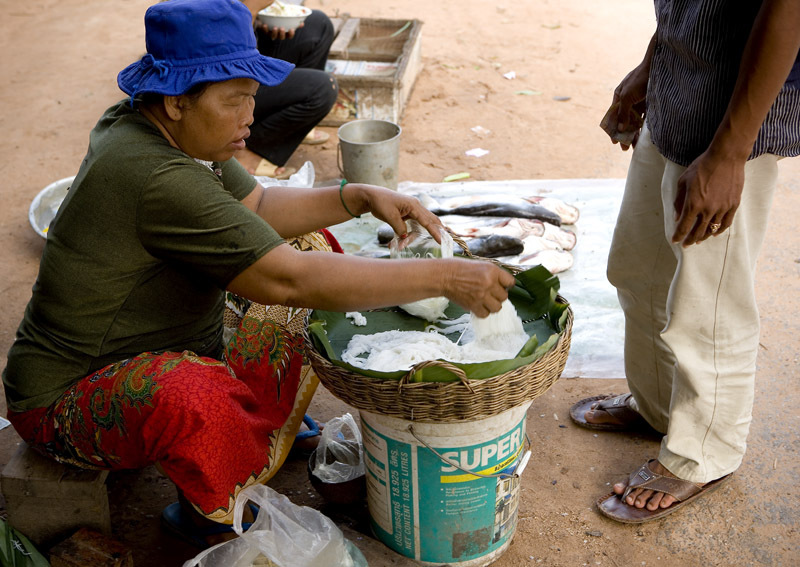 A bit of this and a bit of that, leaves torn and long beans and lotus stems snapped, a spritz of lime and a pinch of salt ... soon enough we're feasting on what must be one of the tastiest items on offer in and around Siem Reap. It's so good we consider returning the next morning before our flight to Saigon. Now I wish that we had. After breakfast we wander up to the tiny market - just a couple of rows of streetside vendors, really - across the road. Many are selling num banh-chok, and we ask our tuk-tuk driver why. 'Because many families in this village make num banh-chok,' he replies. Num banh-chok, morning to evening at the Angkor Wat-Banteay Srei-Banteay Samre crossroads. 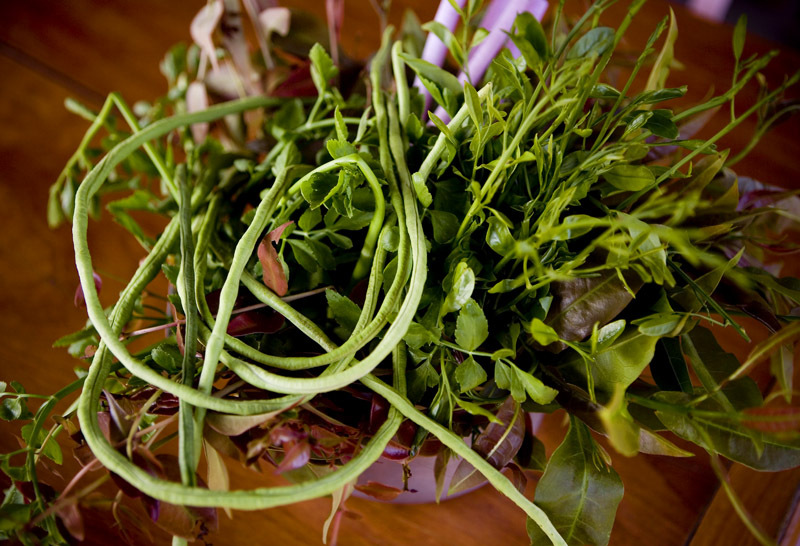 * For lack of a source of info on wild herbs and vegetables in Cambodia I'm relying here on the excellent Edible Wild Plants of Vietnam, which I discovered via Andrea Nguyen's site. I need to stop reading this blog during lunchtime. Chicken salad just doesn't taste as awesome when I'm staring at noodles like THAT. 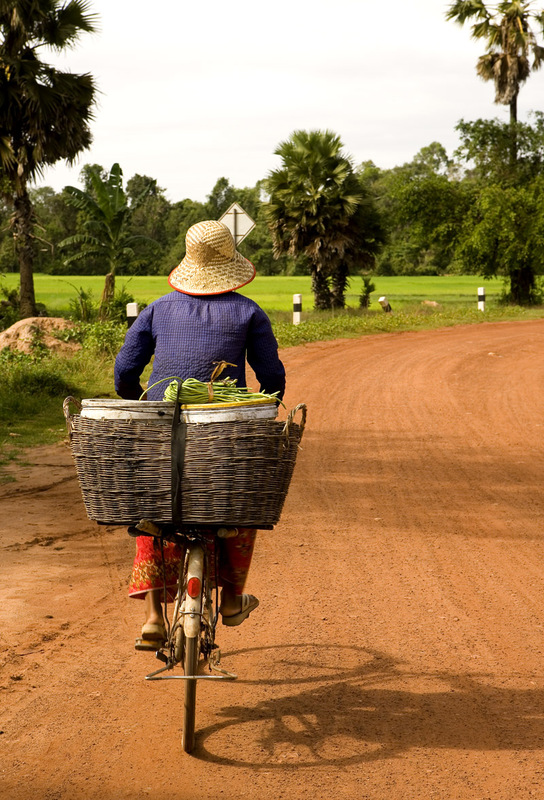 Wow ... you actually braved the bumps on the pathway to Banteay Srei by tuk-tuk! Kirk - agreed. I'm still craving it. Cupcake - you're a wussy! ;-0 Tuk-tuk is the *only* way to see the temples (within about an hour's range, that is).